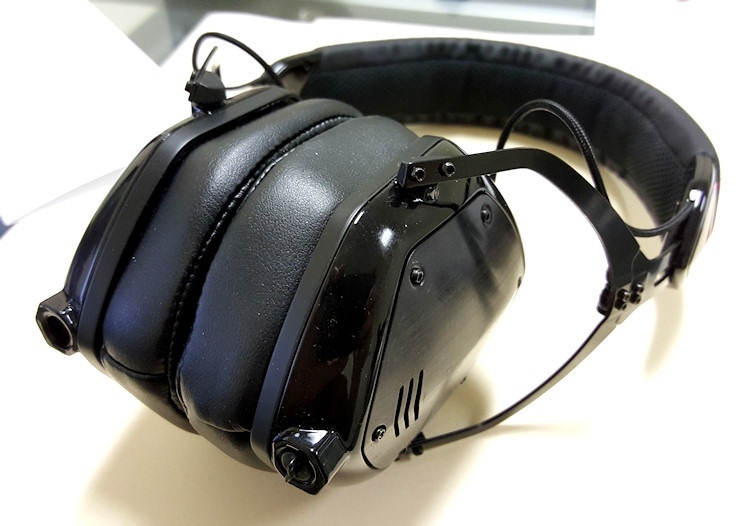 V-Moda M100s. Photo by Brian Watkins. Recently I got my hands on the V-Moda LP2s and reviewed them, and was fortuitous enough to swap up to the M100s shortly after for a good comparison. As V-Moda’s flagship headphone I was excited to see what the fuss is about with the M100s, and they did not disappoint. Two big comparisons I’ll make throughout this review are to the LP2s and to the Denon AH-D5000s that I’ve lauded. The Denons run at a different price point, but for my own taste in sound they are in my humble opinion the finest sounding headphones I’ve listened to. As you’d expect they end up being the standard to which I judge other cans I slide on in terms of sound. The design of the M100s is visually almost identical to the LP2s. The same XL earpad upgrade will work on either set. The M100s are built to fold up, however, something the LP2s don’t do. This allows them to fit in an even more compact hardcase provided with the headphones, which is great for shoving in a bag while traveling. Speaking of the hardcase, it comes loaded with two headphone cables ending in 1/8″ plugs, a carabiner, and a 1/4″ adapter. One headphone cable has a microphone and volume control built into it, whereas the other cable is simply longer (6 feet). 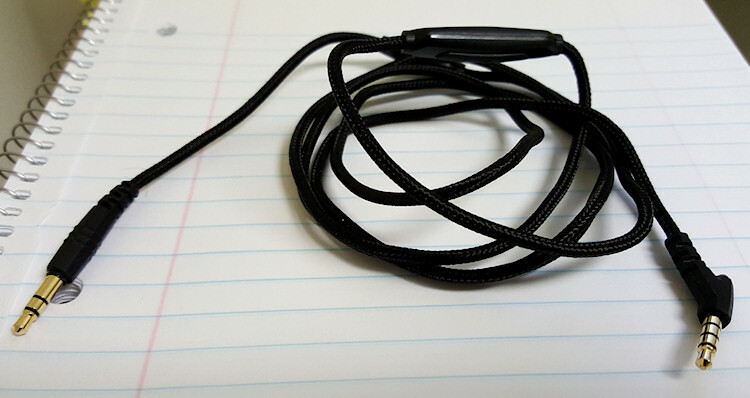 Both cables have a 45 degree angle plug at one end that works well with phones, iPods, and laptops. The metal frame of the M100s is probably among the most durable of headphones I’ve worn. They’re far better traveling headphones than the bulky Denon AH-D5000s and other full size cans, and their clamping pressure holds them on your head better for moving to the music. V-Moda says that the M100s feature a “refined” sound in the bass and mid range. The LP2s were a fun headphone to listen to, but had some bloat in the bass which muddied up the lower mid range. To me this is totally alleviated with the M100s. The bass is strong and punchy, but blends well with the mids to create a very musical presentation. These are definitely headphones for those that enjoy the low end; fans of very neutral or flat sounding cans will probably think these are too bassy or too bright. But load up a song with a good beat and you’ll be tapping your foot. Detail in voices, guitars, and other instruments were clear and present (as opposed to the veiled feeling of the LP2s). Overall sound is darker than the Denon AH-D5000s, but there’s still a crispness in the treble that I’ve found enjoyable. The isolation of closed headphones can, in my experience, make some subtle details easier to pick up in the music. Bass lines are meaty (try “Change the World” by Eric Clapton), cymbals are crisp, and vocals are clear. The increased clarity of the M100s versus the LP2s lends, at least to me, a greater sense of panning and sound stage. I’ve run through through a lot of genres, from techno to rap, classic rock to heavy metal, heavy violin pieces to pop. Lindsey Sterling’s “Crystalize” is one of my favorites, and really shines on the M100s. Other stuff in particular I really enjoyed included Alice in Chains’ Unplugged album, and even vocal-heavy music like Adele. The intimate, isolated sound of closed headphones like these really works with a singer who really tells it with his or her voice. I mentioned it in my LP2 review and it bears mention here. If you find the clamping pressure a little tight you’ll definitely want to consider the XL earpads. In my opinion they make a huge difference in comfort for long term listening. The stock earpads to me are comfortable for an hour or so, but that’s about it. With the XL pads you’ll probably feel music fatigue from extended listening before the headphones themselves will become uncomfortable to wear. Note that my photos here are with the XL earpads. If you want to see how they headphones look stock visit my LP2 review since the outside of the headphones are basically identical. Durable, comfortable, and feature-rich. V-Moda really packs a lot of punch into a small package for the price point. Typical audiophile headphones run over $500, and it’s awesome to have a set of cans so robust and ready to travel for less. I think the M100s work well across all genres. They are a bit more forgiving of older or lower quality recordings than other headphones I’ve demoed, but still shine from good source material. They’ve been criticized for not having a flat, neutral sound, and it’s true. If you want a more sterile, “accurate” sound these aren’t for you. But in my humble opinion, the M100s have a very fun, engaging sound. The sound isolation of these headphones, paired with the detail, really absorbs you into the music. I use them when I work and find that it focuses me, and if you’re relaxing and close your eyes it’s a very intimate listen. Listening to an emotionally powerful song? Get ready to feel it deep. As an owner of the m100’s I agree with your comments. Yes, if imagine there’s are much better headphones out there, but one has to ask, for day to day listening for the average person, is it worth spending, $500 out more for phones? Yes, if your job depends on hearing music to is fullest, then yes, get the best. For everyone else, I truly believe the m100’s will fit the bill perfectly.